We could say that this special issue on food arose from our critical sociological awareness. But the truth is that we just like to talk about food. Carly’s Italian family is always cooking up something delicious, Jess brews her own beer, and when we (Jodi and Arlene) have the opportunity to meet in person, it’s usually over a good bottle of wine and some enticing local cuisine. At one of our weekly bi-coastal Skype meetings, we posed the question: “How about a special issue on food?” That’s when we began to notice that the sociological study of food was everywhere. 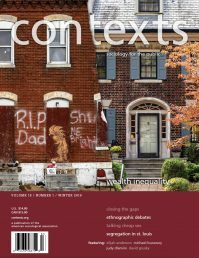 Our call for articles generated an unexpectedly high number of submissions—ranging from topics such as the morals and manners of political banquets, to the eating patterns of elite athletes. In the front of the magazine, now dubbed “smorgasbord,” readers can sample a range of sociological thinking about food—small bites, if you will. When it comes to cooking, the personal is political, according to Sarah Bowen, Sinikka Elliott, and Joslyn Brenton, who take on Michael Pollan’s popular notion that home-cooked meals will save the family, pointing out the hidden domestic labor entailed in putting meals on the table. Stacy J. Williams extends this theme in her Mediations essay on second wave feminist cookbooks that claimed the kitchen as a site of potential domestic equality. Janine Chi explores food as nationalism in her article on the cultural politics of rice, and Grace M. Cho reflects on eating military base stew, and the taste of trauma and its legacies. Michael A. Haedicke takes on the political ideologies that drive food co-ops, asking whether the values of democratic, consumer-owned businesses can survive market forces that are making organic food big business. Ivy Ken questions the wisdom of allowing major corporations such as Pepsi and Hershey to feed our kids through their control of the supply chain to school cafeterias. Amy Hanser and Zachary Hyde note the rise of urban food trucks as indicators of a “livable city” and trace the connections to gentrification, while Joy Rayanne Piontak and Michael D. Schulman chart the alarming rates of food insecurity across the rural United States. Finally, in this issue renowned urban farmer, and former professional basketball player, Will Allen describes his innovative program for ameliorating so-called food deserts by growing food in the city. We hope this issue offers our readers plenty of tasty morsels—and some rich food for thought.